When I told my editor I wanted to review the diamonds on show at Buckingham Palace, I sensed some reluctance. My editor is a woman of culture, as well as the editor of Culture, and her resistance was due, I suspect, to a feeling that diamonds did not properly constitute art. Of course, in strict definition terms, diamonds are not art. And Buckingham Palace, where a selection from the Queen’s hoard of jewels lies in wait this summer for all takers of the official Buckingham Palace tour, is not an art gallery. But I am of the opinion, unbending and harsh, that if you do not get diamonds, you cannot properly get art. Whatever art is about, diamonds are about it, too. Diamond-haters tend usually to hate the lifestyles that diamonds represent. I share this suspicion and totally agree that diamonds are wasted on the rich. They should give them all to me. But I absolve the present Queen. She is, in my view, the finest owner and wearer of diamonds in the world. Her continuing respect for these magic rocks of light, her keenness to keep them on public view, is an object lesson in aesthetic determination. Compare HM’s diamonds with Bob Diamond, and you have before you an encapsulation of everything that is wondrous about life versus everything that is wrong with it. Which is why you really must go to Buckingham Palace and allow the sparkle and shimmer of the royal bling to cut through the beige felt of your everyday existence. This is a show that reminds us why we are alive. The display is positioned in the middle of the palace, so to reach it you need to wander through decorated corridors filled with history. I found myself suddenly confronted by Van Dyck’s great equestrian portrait of Charles I riding towards us on a white stallion. It is probably the greatest of all portrayals of a British monarch. Yet its task here is merely to set some tone for your diamonds visit. Incidentally, Charles I was a superb wearer of jewellery. The huge pearl earrings he sports in Van Dyck’s triple portrait of him, also in the Royal Collection, seem to rhyme perfectly with the sad droop of his fateful face. It wasn’t until the arrival of those vin­dictive art-haters, the Cromwel­lians, that the British he-man’s traditional right to wear ear-rings was challenged. Prince William and Prince Harry would be fighting an important battle for British manhood if they ventured out more often in big, dangly earrings, à la Elton John. 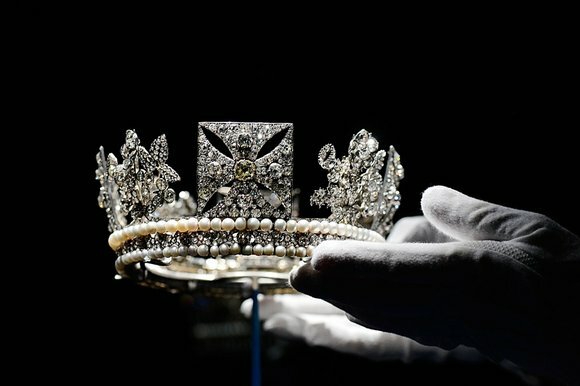 The diamonds selected for the diamond jubilee display come from the Queen’s personal collection and should not be confused with the Crown Jewels in the Tower of London. That is state regalia. This is private queenly pleasure. What we see here has either been inherited from previous monarchs or commissioned by the present one. A dark ramp leads you in a spiral past a succession of illuminated glass cabinets, inside each of which sits a royal jewel with a story to tell. The tiny diamond crown Victoria wore at her own diamond jubilee celebrations was commissioned after the death of her beloved Albert. It was made from the whitest diamonds, because she associated coloured jewels with happier times. Victoria generally wore it perched above a white veil. Although it’s tiny, there are 1,187 diamonds in it, so this Tom Thumb of a gewgaw packs a Tysonesque punch. Its stones were recycled from an existing chaîne de corsage, and all the way through this spangled display, the royal women show themselves to be formidably ruthless when dismantling one set of jewels to manufacture another. Several exhibits were given as gifts by loyal colonial subjects practising ingratiation. The Maharajah of Jaipur must have been out of his head when he presented the Jaipur sword and scabbard to Edward VII. This glorious gold fighting bling, curved like a giant eyelash, is decorated with 2,000 carats of Indian diamonds. Given away! Other fabulous jewels were purchased at auction. In 1932, Queen Mary bought the bejewelled snuff box of Fred­erick the Great of Prussia at Christie’s. It is a rococo masterpiece, a moody green bloodstone box across which white and pink diamonds buzz around, forming busy flower patterns, like dragonflies on a pond. Queen Mary emerges here as the most interesting and intoxicated of the royal diamond lovers. A small woman, she appears in photographs caked in bling that seems too big for her. Mary was the queen in place when the largest diamond ever found, the miraculous Cullinan diamond, a flawless South African rock the size of an ostrich egg, was cut into nine hefty brilliants. The largest are in the Tower, embedded in the crown and sceptre. The rest are here, huge, perfect prisms, mounted on rings, dangling from pendants, sparkling from brooches. When the present Queen met Nelson Mandela, she had Cullinan VII on her chest and Mary’s emerald tiara on her head. Mandela appeared to be wearing a country and western shirt. The Queen sets off her diamonds wonderfully well. In her youth she was a beauty, and the lovely line of her neck and shoulders was the perfect accompaniment to the Grenville Chandelier Earrings or the delicate South Africa necklace. Many of the jewels here were made to come apart and can be reassembled in different combinations. With its huge emeralds in place, the Delhi Durbar Tiara incites the shadow of a harem girl to flit across its wearer. Without the emeralds, she becomes a fairy princess again. By the time I reached the Williamson Diamond Brooch, made for Princess Elizabeth in 1947, a clear diamond flower encircling the finest pink diamond ever found, I was barely able to stand. But this wicked show had one more evil delight saved up for the reeling visitor. The last exhibit is the Diamond Diadem, that fabulous crownlet that HM used to wear on all our stamps. Seeing this definitive trinket close up reveals, finally, the true brilliance of its design, with alternating flower clusters supplying the joy, and stately Maltese crosses conveying the power. Right at the front there’s a yellow diamond, four carats big, of scary beauty. You don’t see it on the stamps. The other 1,333 diamonds aren’t bad either. Or the 169 pearls.